Pep Guardiola almost got everything right tactically on the night and yet ended up losing the tie, thanks to one stroke of genius by Diego Simeone. Atletico Madrid never looked at their steely best at the back and could’ve lost the tie by half-time, but Muller and Simeone had other plans. Bayern made 3 changes to the lineup that started and lost the first leg. Thomas Muller came in for Thiago Alacantra, while Frank Ribery replaced the ineffective Kingsley Coman. In defence, Jerome Boateng returned to the lineup in place of Juan Bernat as Bayern started in a familiar 4-1-4-1 formation. Atletico Madrid knew they need to either score or avoid defeat to make it to the San Siro final, later this month, and made only one change to their winning lineup last week. Diego Godin was back to his full fitness and displaced Stefan Savic from the starting XI. With Simeone you know what you’re going to get, as the Spanish club lined up in a familiar 4-4-2 formation. Bayern Munich struck all the right notes in the first half. High-tempo football, quick transitions, moving the ball wide on every possible occasion, and intriguing off-the-ball movements. Every one of them was a near-perfect tactic. Guardiola’s game-plan looked perfect from minute 1 and by minute 33, they should have had a two-goal lead. Or maybe three. But Thomas Muller just couldn’t get anything right in the box. Having said that, Muller made some excellent runs off-the-ball, enjoying his freedom as a right forward, almost like a false 10. The German international made a few brisk runs through the crowded Atletico defense's belly, even finding himself clear in the box in the 20th minute, only to make a hash of what was an excellent opportunity. But even more than Muller, it was Arturo Vidal whose license to roam free caused Atletico a lot of trouble. 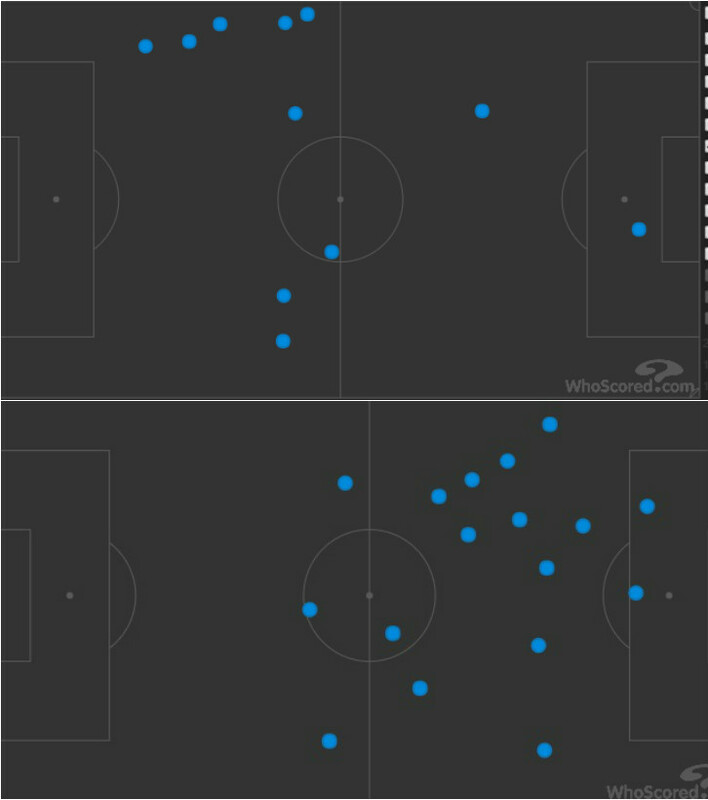 With nobody in particular, marking the Chilean, Vidal drifted in between the two banks of 4, making runs from deep and moving the ball forward quicker in attack. 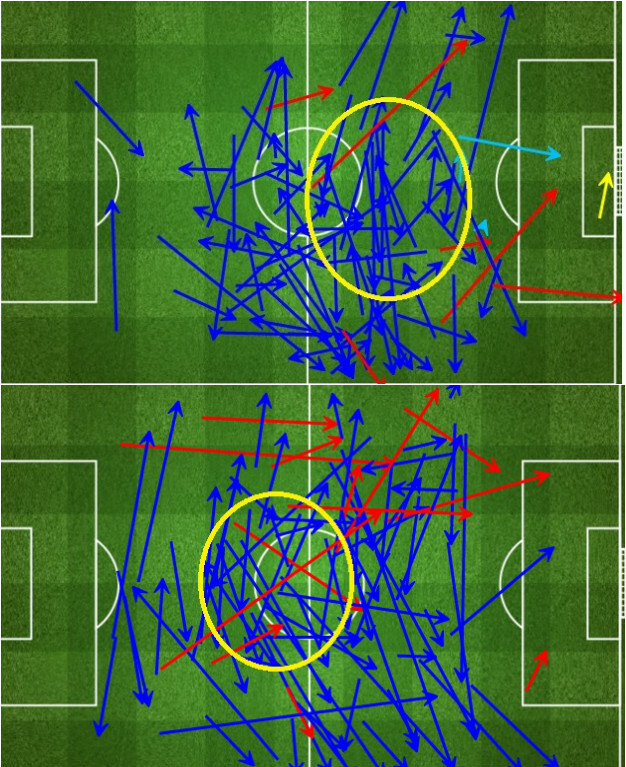 Xabi Alonso too, occupying a central role and dropping behind at will, was the chief architect of most of Bayern's play, initiating and spraying the ball to the wings from the centre of the pitch. Both Vidal and Alonso ensured the German side play at a frantic pace, and they were well and truly on top by the time the half-time whistle was blown. Who knows, if Muller’s penalty had hit the net, we might have had an entirely different tale to tell. Diego Simeone is an elite coach and if you were looking for any testament, his second half substitution to bring on Yannick Carrasco might be the perfect fit. 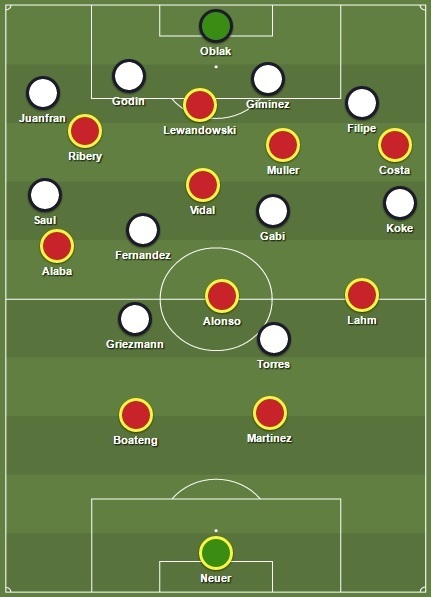 The Belgian came on for Augusto Fernandez and Atletico changed to a 4-3-3, or rather a 4-5-1, to add more bodies to the middle of the pitch--partly to counter the increasing threat of Frank Ribery, but mostly so that the Atletico midfield does not get outnumbered by Vidal, Xabi and at times Muller. The change in formation saw Saul Niguez drop deepest in a 3-man midfield, with Koke and Gabi flanking and supporting the Spanish international. The move immediately paid dividends for the Spanish club, who took the lead after Torres put Griezmann through on goal. But that wasn’t all there was, the change in formation hurt the momentum Bayern had built before the break. So much so that they had only 2 shots from minutes 45 to 60(Atletico had 3) and Atleti, for the first time in the game, dictated proceedings. With Simeone chopping and changing to arrive at the best fit, Guardiola wouldn’t stay back. The first response by Guardiola was to push Vidal higher up the pitch, almost shadowing Lewandowski, and even running beyond him at every possibility. Vidal’s movement was reminiscent of a role perfected by Frank Lampard at Chelsea, and even by Vidal himself at Juventus. By now the Bayern formation was almost a 2-3-3-2 with only Martinez and Boateng sitting in the defence, while Vidal paired up with Lewandowski at the top. But despite reaching the final third at ease, and the ball being well-circulated across the pitch, every opening seemed to come through Douglas Costa. And Costa was wayward all night. When Bayern’s summer recruit was justifiably substituted by Kingsley Coman, Atletico had a new beast to deal with. Coman unlike Costa, likes to get to the byline, or into the box, before attempting a cross/shot and that tested Filipe Luis, who had tamed the Frenchman in the first leg. 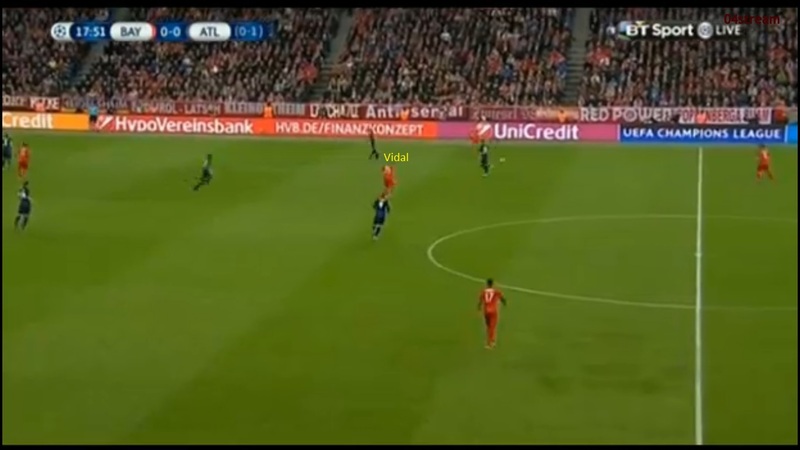 What Coman’s introduction also did was it pulled Muller away from the centre to the right side of the pitch, opening up space for Vidal to move into, and it was his tenacity and desire to get forward that saw him assist the second Bayern goal. Coman would later himself get a glorious chance to put Bayern 3-1 up, but his shot flew wide. Despite the missed chance, Coman’s impact did ruffle more than a few Atletico feathers, but Simeone’s men weathered the storm and came out on the top at the end of it.